So recently, there has been yet another conflict between the Johor Sultanate and the Federal Government. In case you haven’t heard, the first non-UMNO Johor MB, Osman Sapian, had resigned from his post last week, and the Prime Minister Dr Mahathir and Johor ruler Sultan Ibrahim had different ideas over who should pick the next MB. With the appointment of Dr Sahruddin Jamal (one of Mahathir’s choices), it would seem that the issue is settled for now, and His Royal Highness have said that he will be imposing certain conditions upon Sahruddin. But people have been talking about it, and those who follow the news knows that this wasn’t the first issue between Johor’s royals and the central government, and it most probably won’t be the last. Signing a contract for Season 10… Gif from Tenor. 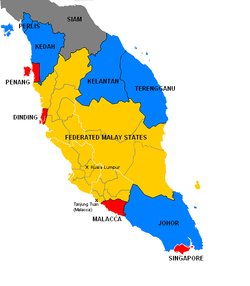 The Straits Settlements (red), the Federated Malay States (yellow) and the Unfederated Malay States (blue). Img from Wikipedia. Compared to the other two groups, the Unfederated Malay states enjoyed greater autonomy from the British, and while the four northern states were given to the British by Siam under the 1909 Bangkok Treaty and were forced to take on a British adviser, Johor had a different story. Sultan Abu Bakar, the current Johor Sultan’s great-great-grandfather. Img from Wikipedia. Johor at that time was ruled by Sultan Abu Bakar, the current Johor Sultan’s great-great-grandfather, and as it happens he was a close friend to the Queen of England at that time, Queen Victoria. 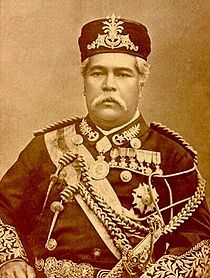 Perhaps that is why in 1885, the Sultan (then wearing the title of Maharaja) went over to London and signed a treaty of friendship with the British empire, which among other things states that the British Empire recognizes the independence and sovereignty of Johor, that they would befriend, protect and develop Johor together, and both sides will ensure the safety of each other. Through this agreement, the British can place a General Adviser in the state, but it was only in 1910 that a General Adviser was actually appointed, and even then the only influence he had over Johor at that time was concerning foreign affairs. After the treaty, things went well for a while, and in 1895 Sultan Ibrahim ascended the throne. After a while, though, the British got annoyed at the Sultan’s modernization efforts and Johor’s determination to uphold its autonomy (and some would say lavish spending), so they drew up a report critical of the prison conditions in the state, which pressured the Sultan to increase the power of Johor’s General Adviser to the level of a Resident in the Federated Malay States. So in 1914, Johor finally got a British Resident. If you remember the recent issue surrounding the Rome Statute, one of the alleged problems with it was that it will remove any immunity or special procedures related to any person in the International Court of Crimes’s (ICC) jurisdiction. 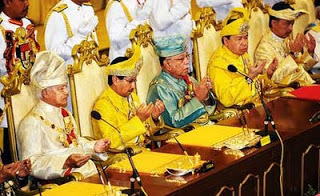 Malaysia initially signing it may have been a deja vu moment, as the immunity of royals have already taken a blow before, back in the 1990s. Some of us may have heard of something called the Gomez Incident, but if you haven’t, here’s a quick version of what allegedly happened. In 1992, Tunku Majid, the second son of the Johor sultan at that time (Sultan Iskandar) allegedly assaulted a Perak hockey goalkeeper (Mohamed Jaafar) because Perak won a match with Johor by a penalty stroke. 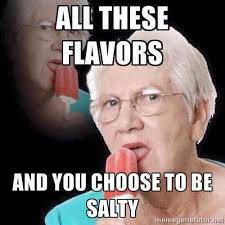 Meme does not refer to anything or anyone. Img from me.me. Jaafar made a police report about that, and the Parliament pressured the Malaysian Hockey Confederation to ban Tunku Majid from any national hockey tournaments for five years. The Sultan at that time didn’t like that, so he pressured the state education department to order Johor school hockey teams to boycott national tournaments. This in turn upset a hockey coach named Douglas Gomez, and he criticized the education department for it and called for Johor Hockey Association key office bearers to resign. The Sultan got angry at that, so he summoned Gomez to the palace and allegedly beat him up in front of his bodyguards. The incident caused widespread moral outrage among the Malaysian public. Following that, in Dec 1992, a special parliamentary session was held where a resolution to curb the powers of the rulers (if necessary) was unanimously passed. After negotiations with the Sultans, several amendments to the Federal constitution was proposed, most notably allowing royals to be tried for crimes in a special court. It appears to be the Mahkamah Khas Raja Raja, but we haven’t been to one, so we dunno. Img from Norsurieanie’s blog. Out of the nine rulers, three withheld their consent to these amendments, one of them being the Johor Sultan. A standoff sort of happened (hence the constitutional crisis), and the Johor Crown Prince, Tunku Ismail, who was 8, recalled some particularly nasty memories of that time, including how his mother was thoroughly searched upon returning from Singapore. “I will never forget the 1992 Constitutional crisis. I still remember how my family was treated by Federal Government officers. I remember things such as trying to disband the Johor Military Force, Johor Exco members were told not to receive my late grandfather at the airport, how JKR was told not to fix and maintain anything at any of the Johor Palaces.. I still remember everything and the individuals responsible for it,” – Tunku Ismail Sultan Ibrahim, as reported by The Star. Tunku Idris’ post. Img from MalayMail. For those of you who don’t know, secession is when a state or a part of a country decided to get out and make it on its own. 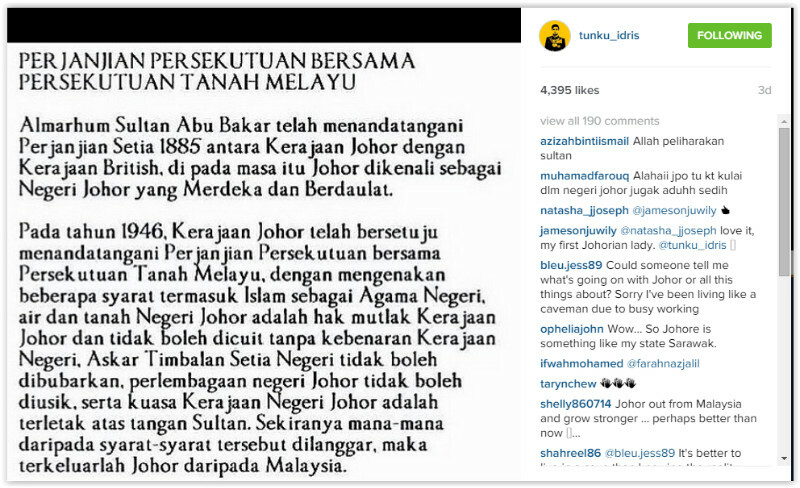 Sometime in 2015, the Johor Crown Prince (we’ll be calling him TMJ from now on) said in an interview with a sports publication that Johor has the right to leave Malaysia if it finds a breach in the terms it agreed to when it agreed to join the Federation of Malaya. “…Over the years, we’ve always been strong and independent as well as resourceful. In fact, we only joined the Federation of Malaya, upon both parties agreeing to several basic terms. And if any one of those terms are breached, we have every right to secede from this country,” – TMJ, in his interview with Fourth Official (quoted by Says). We’ve written an article about the Royal Johor Military Force before, if you’re curious. Img from iProperty. 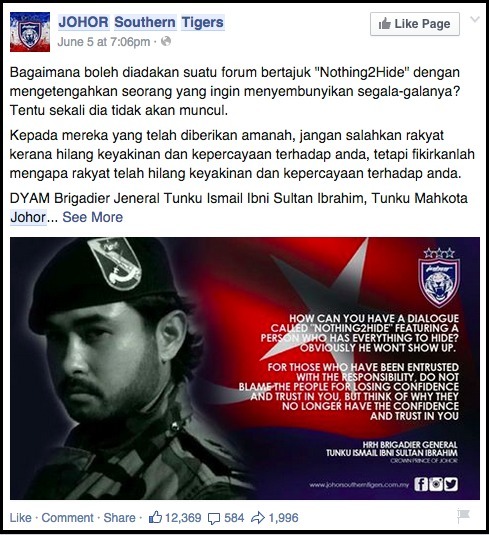 It was unclear what prompted Tunku Idris to post that, but the event happened shortly after TMJ made a remarkon former Prime Minister Najib Razak not showing up to a forum called ‘Nothing2Hide’, and the former Tourism Minister Datuk Seri Nazri Abdul Aziz made a statement telling TMJ to stay out of politics unless he wants to ‘get whacked’. “He should keep out of politics because otherwise, he will be subject to the same rule and we will whack him. Rulers and royal families are above the law. If you want to be a politician then say so, so we can hit you back for what you say,” – Nazri Aziz, as reported by the Star. Nazri had later met TMJ and asked for his forgiveness three years later, but what about the secession? Well, according to Prof Datuk Dr Ramlah Adam, Director of UniMAP’s Malaysian’s Royal Institution Research Center, the agreement that Tunku Idris mentioned, along with several other British-era documents, are considered null and void after independence. However, it’s not entirely impossible, though. 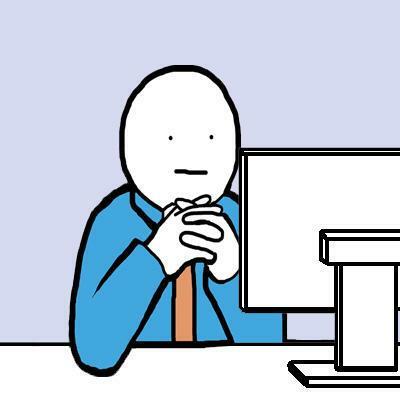 We dunno how people feel about the outspoken-ness of Johor’s royalty now, but if you look back before GE14, they were quite popular for speaking up against the government then. Post no longer available, taken from Cilisos. While in law their role had been reduced to somewhat a ceremonial matter, there’s no denying that royals still have some measure of power in Malaysia. After Nazri’s ‘whacking’ statement back in 2015, a large number of Malay NGOs gathered outside the Johor Palace in support of the Crown Prince, with a representative saying that Johoreans felt that it’s ‘unbecoming’ for the minister to publicly chide a member of the royal family. Due to their special position, they have the power to voice out on issues that affect their people and their country without fear, and due to their influence, the royals can serve as an effective counter balance in politics, if done right. According to Tengku Abdullah, the Regent of Pahang, this authority of the royals to advise and express opinions follows a concept of constructive patriotism, and it’s a big responsibility to hold, especially in a multicultural country like Malaysia. “A constructive patriotic would question and criticise for a better change for the country, he would express anger and shame on the action by certain parties which have a bad impact on the country… Our country’s uniqueness also reveals the need for a neutral institution that has a voice in advising and expressing opinions. If there is no such institution, the prosperity and unity of our people will be ruined,” – Tengku Abdullah, as reported by NST. Pondering the ramifications of being neutral be like… Img from Imgflip. “I am (of) the opinion that if we assume that those who choose prime ministers and menteri besars are the monarchs, we will no longer be a democratic country… We would be a country with an absolute monarchy.” – Dr Mahathir, as reported by the Straits Times. “The Johor government has long been established, where it has its own culture and way of administrating itself. 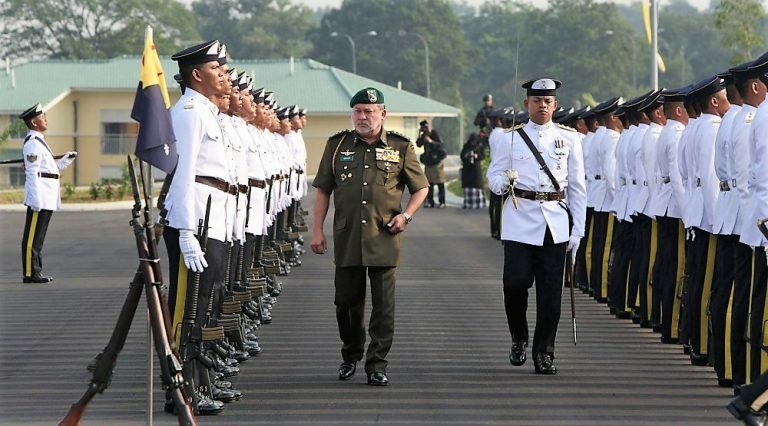 Those on the outside do not have to start talking about who has the power and how to administer the state.” – Sultan Ibrahim, as reported by the Straits Times. …it would seem that the bottom of the conflict here (and perhaps in Pulau Kukup as well) is about who holds the power regarding certain matters in the state. Storms have a habit of clearing the air once they’re over. But something tells us this one’s just getting started.